Captain Shreve coach Keith Greene has quickly built the Lady Gators into a statewide girls basketball power and for his efforts the soft spoken coach was named the 2019 Louisiana Sports Writers Association Class 5A Coach of the Year. Greene took over a floundering Shreve program four years ago. Prior to his arrival, the Lady Gators had never won a district title but have now won three straight. Shreve had never won a state playoff game until three years ago when they won their first and had never made the state tournament until last year when they advanced to the 5A semifinals. Then, last month, they won the school’s first state title in any sport as a 5A program since the 1973 football title. Shreve entered the 2019 tournament as a No. 9 seed but defeated everyone in their way and finished 31-4. This entry was posted in Times on April 5, 2019 by captains. On a night where the senior members of the Captain Shreve track and field program were honored at the Gator Relays, it just seemed natural that it would be a couple of Lady Gators to lead the girls team to a convincing win, scoring 218 points, 133 points more than second-place C.E.Byrd. The Captain Shreve boys team won its division as well, scoring 108.5 points. Shreve senior Taylar Christopher, who competed with her mother and father looking on, got it started in the field events, winning both the shot put (37’7) and the discus (101’2.5). Her throw in the shot put was a personal record for Christopher, who has been in the program for three years. This entry was posted in Times on March 24, 2019 by captains. Dressed nattily in all black, save for leprechaun green ties, the Captain Shreve coaching staff looked like the luck of the Irish had to be on their side during Saturday’s LHSAA Class 5A state championship game in Rapides Coliseum. It was, but the Lady Gators didn’t need luck when it went to war with a bunch of athletes bent on adding to their historical run this season. Seniors Kennedi Heard, Aaliyah Stevenson and Nahja Scott will go into the record books for leading the Lady Gators to a 66-57 victory over Denham Springs for the first state title in school history. This entry was posted in Times on March 3, 2019 by captains. 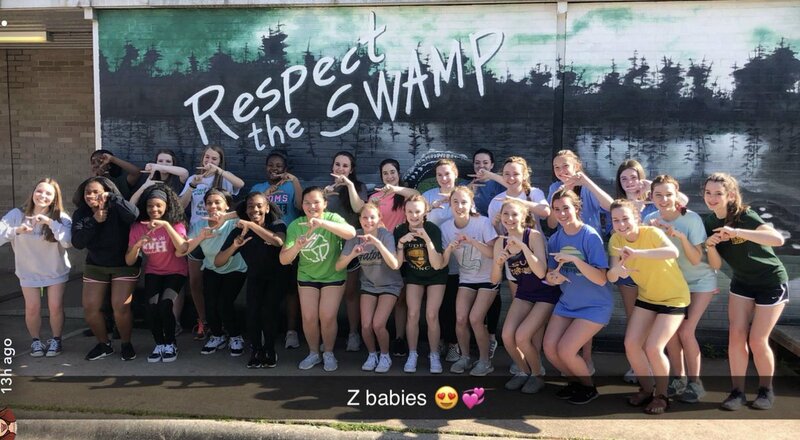 In some ways like the Starship Enterprise, the Captain Shreve Lady Gators are going where no Lady Gator team has gone before. Thanks to a feisty bunch of athletes bent on making school history, the Lady Gators are moving to the LHSAA Class 5A state championship game for the first time after knocking off East Ascension Thursday 65-49 night in Rapides Coliseum. Captain Shreve is now 30-4, another historical mark, while the defending state champions saw their season end at 24-3. This entry was posted in Times on March 1, 2019 by captains. Captain Shreve certainly didn’t perform like the underdog Thursday night. The ninth-seeded Lady Gators traveled to Sam Houston and wiped out the top seed in Class 5A, 61-48, to earn a berth in the LHSAA Girls Marsh Madness in Alexandria next week. Shreve headlines a group of eight semifinalists from northwest Louisiana that will invade Rapides Coliseum. The Lady Gators will face No. 5 East Ascension at 6:15 p.m. on Thursday. The Class 5A title game is scheduled for next Saturday (March 2) at 8 p.m. This entry was posted in Times on February 22, 2019 by captains. The Captain Shreve Lady Gators proved their No. 9 LHSAA seeding was a bit off the mark Thursday night when they went on the road and blasted No. 1-seeded Sam Houston, 61-48, in the LHSAA Class 5A state quarterfinals. Super sophomore Addison Martin earned a nice award from her teammates after scoring a team-high 26 points against Sam Houston (29-4). Addison was consistent throughout the game with her offensive and defensive rebounding and her inside play,” Shreve coach Keith Greene said. “They had no one to match up with her on the inside and she went to work. At first glance, the decision by Captain Shreve coach Keith Greene to hold senior night for his three superstars following a first-round LHSAA Class 5A state playoff game against Fontainebleau appeared a bit brazen. For it to happen successfully, his team had to earn a playoff game, be seeded high enough to get a home playoff game, and then win said playoff game. But even though Greene is brazen, he ain’t that brazen. The night that honored Nahja Scott, Aaliyah Stevenson and Kennedi Heard came when it did on the schedule because the regular season home game with Bastrop, which was supposed to be Senior Night, was canceled. This entry was posted in Times on February 15, 2019 by captains. Captain Shreve girls basketball standout Kennedi Heard is The Times Athlete of the Week for the week ending Jan. 25. Heard, a senior, received 52 percent of the more than 16,000 votes cast for five northwest Louisiana student-athletes. Parkway soccer player Faith Ingles was second with 31 percent of the vote and Natchitoches Central guard CJ Carpenter was third. Heard was the key ingredient in the Lady Gators’ perfect run last week in District 1-5A as coach Keith Greene’s club ran its record to 25-4 overall and 11-0 in the league. Shreve dominated shorthanded Parkway and Evangel during the week. This entry was posted in Times on February 4, 2019 by captains. Gage Simpson is a sterling center defender for the Captain Shreve soccer team, which is in control of its destiny in the district race after recently going 2-0. But Simpson’s greatest asset with the Gators might be his recruiting ability rather than in deflecting the opposition’s offense. Entering the 2018-19 campaign, coach Brett Barker’s team was in need of a shutdown goalie. Enter Simpson, who talked 6-foot-4, 245-pound Cade Davis into making the move into the net after playing tight end for the Shreve football team. In addition to being a recruiter, Simpson adds a lot to the soccer team’s overall GPA, carrying a 4.7 mark to shine for principal Ginger Gustavson as a student-athlete. This entry was posted in Times on January 9, 2019 by captains.